Jumbo Steak knives are a must have for any meat lover; they bring a real bistro feel to any home and are a rare treat when you are visiting friends for dinner to be able to use these classic pieces of cutlery. Designed - as the name suggests - to get through beef and other cooked meat, the jumbo upgrade makes these particular style of steak knife really easy to handle and make you feel like you’re eating in a traditional steak house. We wanted to do a round up of some of the best jumbo steak knives, and we are always aware of the different budgets that people face. As such we have broken down our reviews in to 4 categories (which you can see in the table of contents above) - we cover off the best quality, then the best set of knives to give as a gift. We then do the cheapest set and finish up with what we think are the best value; this will be interesting to a lot of readers as it offers the best quality/price balance! These german manufactured steak knives are some of the highest quality jumbo knives you can get. There are fewer buying options in this jumbo category, so it’s a real pleasure to find these high quality knives from Europe. They are forged from 100% German stainless steel and wrapped in super high quality, and beautifully finished Asian teak to give them a real contemporary look and feel. The blade steels themselves are full tang, meaning it is a single piece of forged steel that then has the wooden handles rivetted on; this gives them a good, heavy balanced feel and will make them a joy to use. 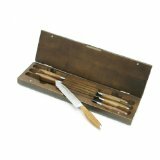 We highly recommend this set if you are looking for the top quality, but remember that with the highly polished blade and genuine wooden handles, you are best hand washing them and not putting them in the washer! So, not for the lazy cooks, but definitely bring a note of excellence to the dinner plate. Whilst the Schmidt Brothers knives above are super high quality, we think these Outset Jackson jumbo steak knives make of the best gift sets you can get for a steak lover. Similarly high quality, there are only 4 knives in this set bringing their price point down to a range that is more palatable for most people’s gift giving budgets. 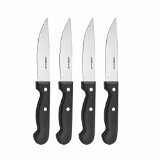 This set of 4 classic steakhouse knives feature super sharp knife tips and a very fine serrated edge, meaning you can finely slice your perfectly cooked fillets with immense satisfaction. As you can see from the picture above/to the right, this set also features contoured rosewood handles, making them super comfy to hold and use. Again, with any wooden handled cutlery, or those with high quality steel blades we definitely advise Handwashing. Now, we know that not everyone wants to spend as much on cutlery, and just need something to get the job done. As such we would recommend this Faberware set in the best cheapest category. Here we see 4 quality knives coming with a lifetime limited warranty at a price point well below the other jumbo knife sets we’re featuring. This is definitely a good choice for those who are budget conscious, but there is still a tone of quality and consistency running through these steak knives. The stainless steel blades are highly durable and the chunky grip handles really give these knives a taste of the jumbo steakhouse feel we all love and find so comforting! Faberware advise handwashing, and whilst we agree, it is less imperative for plastic handled cutlery such as these. We are wrapping up these reviews with what we think are the best value jumbo steak knives available right now. We judge value to be defined as the trade off between price and quality - so these knives are more affordable than some of the quality/gift sets listed above, but are of a quality that won’t disappoint. These Cook N Home full tang knives are solidly built with triple rivet handles. These knives have the added benefit of being Bakelite, meaning they will give an added benefit of increased hygiene, and they are ergonomically designed to be a joy to use. Now, this is obviously one of the larger jumbo sets we have covered off here, with 8 knives with a 4 and three quarter inch blade. All in the knives are 9.5” so will definitely need a bit of storage consideration given there is enough here for two families to get through a steakhouse dinner! Cook N Home advise against the dishwasher for cleaning these knives so better to protect your investment by hand washing! All in there are some great jumbo steak knives here - a set for a broad range of buying needs; top quality sets, best value, cheapest and of course the best for a gift set. With all cutlery products we always recommend careful handwashing with warm soapy water as the best way to protect them and keep them in good shape for years to come! So here we are another year 2015 and it’s time to review some of the best kitchen knives on the market. As always say more players of the top of the market and we Wanna spend some time reviewing some of these top and kitchen knives you can make the best and most informed decision. Firstly restarting this Victorinox classic chefs knife. Novator not so well known for producing very high and high quality knives at very good prices. Granted it’s not the most attractive and doesn’t have some of the traditional portal all metal styling we see some other European manufacturers reading Japanese knife orders but they create excellent kitchen knives are always highly rated highly reviewed and highly valued. This classic 8 inch Swiss knife is made in Switzerland by the cutlers that have been behind the company hundreds of years comes with a lifetime warranty and is absolutely dishwasher safe. Now this is worth talking about is most nice manufacturers advise that the knives for hand wash only. It’s a real timesaver knowingly put these in the dishwasher and be done with it. Another very interesting feature these lives is the urban ergonomic handles these are using a patented plastic rubber technology that means that slip resistant when wet. It’s very dangerous to have plastic handles which are more generic cheap kitchen knife manufacturers put on them because when you get wet hand or even oily hands,they become very dangerous to be using you could easily cause harm. You really can’t go wrong with this night if you’re looking for new chefs knife or even set they come highly recommended. They are even used by professional kitchens and our national sanitary foundation approved meaning they have minimal exposure to breeding bacteria. We would definitely say that this is one of the best kitchen knives of 2015 and you can check it out oon Amazon. 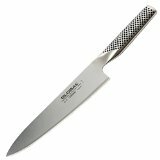 At the moment review some of the best kitchen light of 2015 second on the list is this Henckels international classic 8 inch multipurpose chef’s knife. It’s the perfect apartment from the kitchen for all of your chopping slicing mincing and dicing requirements. The chefs life is made of carbon steel sourced in Germany that hot dropforged for durability this means that the knife edge knife blade itself is less exposed to damage through extreme strain and stresses and temperature. Handle is triple riveted which means there’s a wooden handle on there with three rivets through it which go through the handle and into the tang which is the solid core of the knife itself. Additionally there is a bolster on this knife, meaning there is a separate piece of material separating the handle from the sharp and blade edge. This is a particularly important safety feature because it means when your hand is wet and slippery and you slip, you will not put your hand on the blade itself you’ll be blocked by the Bolster so we really are big fans of that. Again was with seeing a Victorinox knife being recommended and okay for dishwasher use device here is that this is dishwasher safe knife but does have hand washing recommendation. However don’t think this is a compromise in terms of quality and durability because it doesn’t come with a lifetime warranty. These are classic knives that use the world over by home enthusiasts and also professional kitchens. Henckels are a well-established manufacturer and have been making cutlery for hundreds of years, and is well worth a look especially because their prices tend to be a little bit more on the entry-level side that some of the more expensive manufacturers. In order to get the best out of European steel knife blades such as this one we strongly recommend a little and often approach to knife sharpening whereby you are not too heavy-handed with your sharpening steel or sharpener. Continuing our write up of some of the best kitchen knives of 2015 we come to this global G2, 8 inch chefs knife. Now you can see clearly from this picture of global really do make some beautiful looking kitchen knives that set them apart from many of their competitors. The closest competitor in terms of visual appeal aesthetics would have to be a company called Shun who also make Japanese-style kitchen knives at the higher end of the market. This is an incredibly popular knife made by global and is a lightweight highly balanced 8 inch knife or for those of you that like to work in metric it’s approximately 20 cm long. The blade is made of a high-tech combination of stainless steel which includes some secret sauce technology to ensure that the blade stay shop also is robust and flexible at the same time. Global make knives which remain razor-sharp and exceptionally well performers so much so that we don’t often recommend global knives to people who aren’t as experienced handling shock to tonight just because the risk of cutting yourself is so great. Again were big fan of covering off with the nights are dishwasher safe and in this instance the recommendation is absolutely to hand wash the knife only it’s very quick to clean this night by hand because it is a single tang knife, which means there is no additional material beyond the core of the knife itself so it’s very quick and easy to wash up by hand. Remember for maintaining your knife and keeping a sharp we recommend light and frequent sharpening, however it is worth bearing in mind this is a Japanese style kitchen and the knives are sharpened and created at a slightly steeper angle and lots of other European kitchen knives. As such you do need a special sharpener for this we would tend to recommend that Mino Sharp Plus which is specifically made to shop and kitchen knives of the Japanese-style. You can find this knife over on Amazon for the best price. Every year we summarise and review some of the best kitchen knives on the market typically chefs knives city you can make the best and most informed buying decision. This year were reviewing three kitchen knives could see in the table above one from Victorinox which is a Swiss-based manufacturer who have a long heritage of making quality knife edges this is a very practical kitchen knife very affordable and won’t let you down whilst it might not be the most attractive knife in the review set it is very performance and lightweight and would be very recommended for those who are budget conscious. Secondly we review a Henkel’s international classic 8 inch chefs knife now if you’re not aware Henckels is a German kitchen knife manufacturer that has also been around for hundreds of years to use special hot drop forging techniques to you improve the resilience and durability of the knife blades. This is a classic design withth a wooden handle triple riveted and with a very strong knife call you can’t go wrong with these are used worldwide by whom cooks and professionals alike and are not too expensive so if you are looking to get out your kitchen with some knives in 2015 this would be well worth a look. Finally review one of the most attractive lives that you can get on the market which is a global G2 20 cm Chef knife, now this is obviously a very Japanese-style knife in the way it appears and also the angle of grinding on the blade is more steeper than the European models above. This means you have to take slightly different steps of caring for your lives and ensure that you don’t put this one in the dishwasher and use a special Japanese-style knife sharpener. Who Will Get the Best Kitchen Knife of 2014 Award? 2013 is behind us..what can we expect on the kitchen knife front for 2014? 2013 was a quiet year in general for kitchen knives. Whilst in 2012 we had the amazing set of Ken Onion Shun knives which were quite possibly some of the most beautiful and distinctly designed kitchen knives that have ever been. We also had a great series of blades from Victorinox which looked at cornering the more entry level end of the market. So what to look forward to in 2014? Well, as we all know it is quite rare for any of the big forging houses to come out with entire new ranges and styles of knives, but I have got a good feeling about the year ahead that we could be in for something exciting. I have nothing to substantiate this with at the moment but I will be keeping an ear to the ground to see if it rings true. Some of the guides and information here has lapsed a bit in the last few months, so I'll hopefully be updating with a bit more regularity in to what's going on in the world of kitchen knives! Been a while since I posted an update to this site, but a good steak out a restaurant the other night prompted me dust off a bit of steak knife research to see who's currently top of the game. The top spot for most popular and best all-round steak knives is hotly contended for by a combination of Wusthof, Henckels, Victorinox, Shun and the iconic Laguille knives. The prices range dramatically depending on what sort of thing you're looking for, but there's always something for your budget. Shun make some of the most beautiful kitchen and steak knives on the planet - hands down. Some of their kitchen knives range in to the hundreds of dollars, but by jove they are great to look at! Same with their steak knife collection. However, their price range can make them a little bit too out of reach for most people. Wusthof, however, manage to walk the line between really great steak knives; well designed, beautifully balanced and super sharp and cost - especially when the likes of Amazon are able to offer such a good discount at this time of year! The knives come with a life time warranty which is as much testament to Wusthof's faith in the product as well as the engineering behind the product. So, if you're looking for a great set of steak knives this Christmas, look no further!